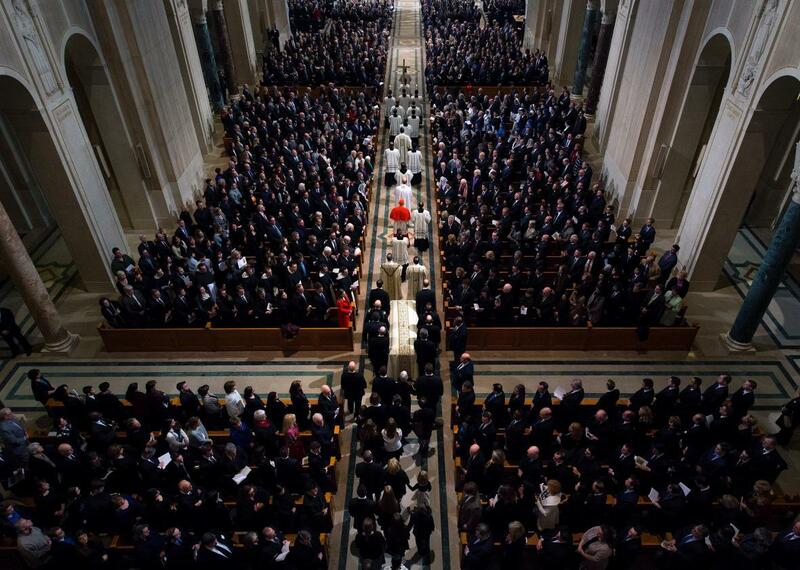 Ushers guide the casket during the funeral Mass for Associate Justice Antonin Scalia at the Basilica of the National Shrine of the Immaculate Conception February 20, 2016 in Washington, D.C.
Mourners gathered at the Basilica of the National Shrine of the Immaculate Conception in Washington to commemorate late Supreme Court Justice Antonin Scalia, who died unexpectedly last week at 79. 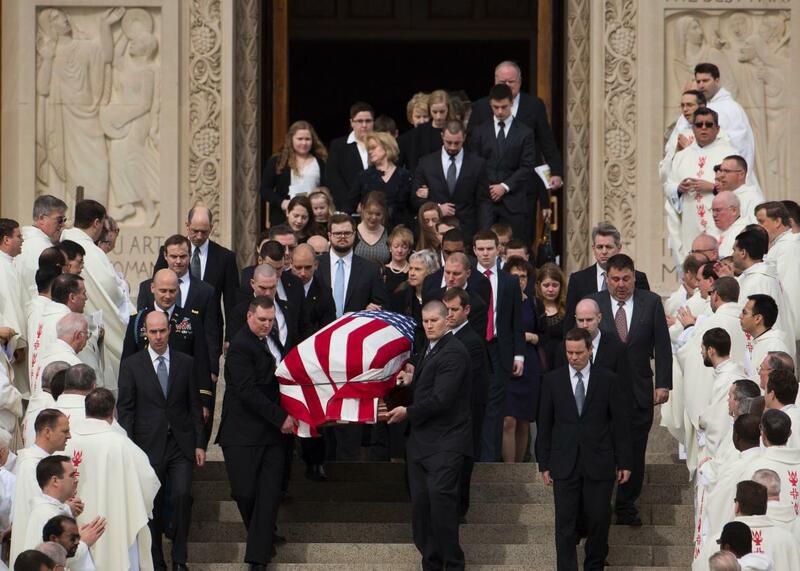 Justices, judges, congressional representatives, cabinet members, the vice president, and a presidential candidate were present to hear Paul Scalia, the late justice’s son, deliver Mass for his father. “In the past week, many have recounted what Dad did for them,” Scalia said. “But here today we reflect what God did for Dad. How he blessed him!” He also mixed some humor into the service: “Sure he forgot our names at times or mixed them up, but there are nine of us.” Mostly though, Scalia focused on his father’s family life and faith rather than his time at the Supreme Court. 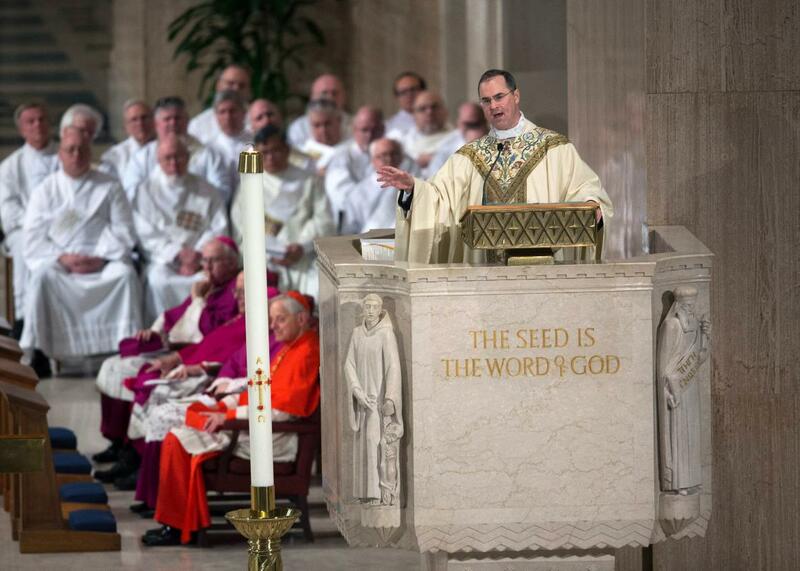 Father Paul Scalia, son of Justice Antonin Scalia, center, leads the funeral Mass for Associate Justice Antonin Scalia at the Basilica of the National Shrine of the Immaculate Conception February 20, 2016 in Washington, D.C.
Scalia’s son was not the only one who read at the service that took place in the country’s largest Roman Catholic church. Justice Clarence Thomas read a passage from the New Testament’s Book of Romans while the executive director of the Federalist Society, Leonardo Leo, read a passage from the Old Testament’s Book of Wisdom. 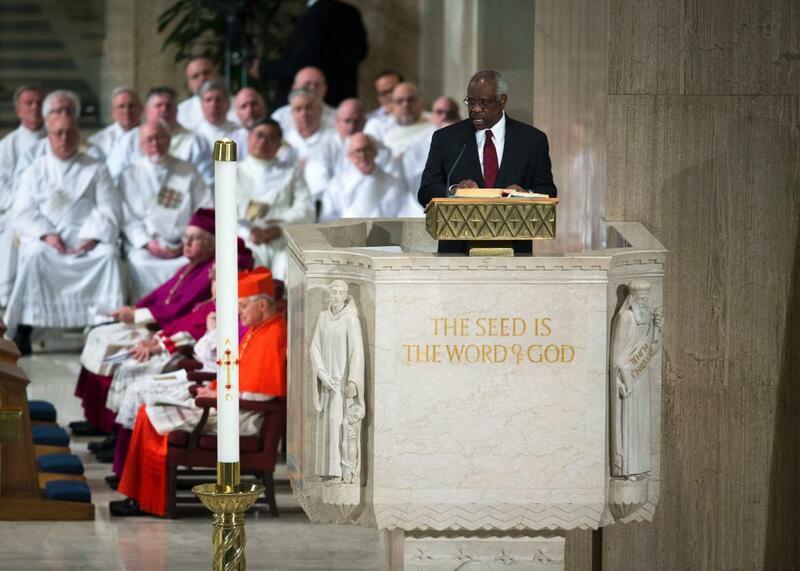 Justice Clarence Thomas makes a reading during the funeral Mass for Associate Justice Antonin Scalia at the Basilica of the National Shrine of the Immaculate Conception February 20, 2016 in Washington, D.C. In addition to all eight sitting justices, several members of the U.S. Court of Appeals for the District of Columbia, including Sri Srinivasan and Patricia Millett, widely seen as possible candidates to replace Scalia, were also present. After the Mass, family pallbearers carried the casket to a hearse for a private burial. Scalia’s family said a more secular memorial service for the late justice will be held on March 1 at the Mayflower Hotel in Washington. With family members following behind, pallbearers carry the casket of late Supreme Court justice Antonin Scalia down the steps of the Basilica of the National Shrine of the Immaculate Conception following the funeral, February 20, 2016 in Washington, D.C.